HOPE – Former Tyson Foods CEO Don Tyson, son of the company founder, left college to work for his father, turning an Arkansas business into an international industry. But, it was Tyson’s commitment to the team members of Tyson Foods, that has drawn talent to the company. 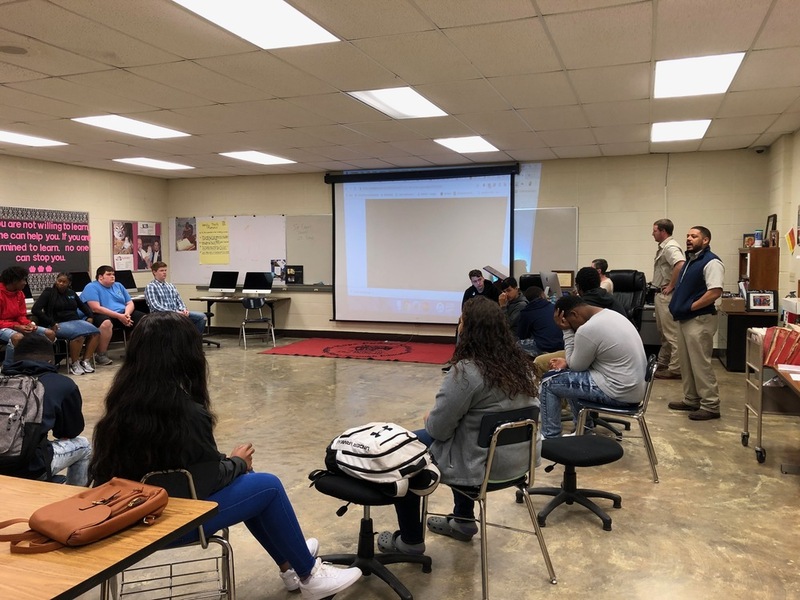 Tyson Hope Complex general production managers Ryan Harris and Danny Byrne told students in the Noble Impact program at Hope High School that commitment holds true today. The Hope Public School District Manufacturer of the Month for March, Tyson Foods, employees 122,000 team members and is headquartered in Springdale, Arkansas. The food company is the largest single industrial employer in Hempstead County. That worked for him in his 15 years at Tyson’s Hope Complex processing facility, where Harris said he began, literally at the bottom cleaning production floors. “It’s unreal how the company has helped me,” Harris said. Coming from a troubled background, Harris said he was headed in the wrong direction before working for Tyson. Now, he has a good family life and career outlook that includes a 401K retirement plan, company stock options, health and dental insurance for himself and his family, and the ability to continue to grow with the company. “Working at Tyson is more than chickens,” said Harris. He said the company has continuing needs for automation engineers, maintenance technicians, quality control personnel, food science specialists and numerous support function team members. Candor between team members in collaboration produces improvements and solves problems. The care that goes into company safety is respected when each team member is committed to the team concept, and that helps drive creativity to bring about growth for “team” members and the company, they said. “You give it your best and try to work your way up,” said Harris. Byrne graduated from college with a degree in agriculture education, intending to teach agriculture in the public schools. But, when he learned how well Tyson paid its team members, he changed his mind. He said employment opportunities at Tyson Foods are always available, and can be explored at www.tysoncareers.com. Part of the foundation for the pay and benefits which Tyson can offer stems from how the company has become a leader in poultry and protein foods production and marketing since its beginnings in 1931, when company founder John W. Tyson settled in Springdale and realized the potential of the poultry business there. Tyson took Arkansas chickens north, literally, selling the poultry in midwestern markets; then, during the meat rationing years of World War II, he began raising his own birds and producing feed for local growers. In 1947, Tyson incorporated his business, which now provided hatchery chicks, feed and live transportation to processors. Don Tyson joined the business in 1952, at age 22, after leaving the University of Arkansas; and, ultimately establishing the company as a production processor in Northwest Arkansas in the 1950s. Tyson Foods became a public corporation in 1963 under Don Tyson, and began its move into the consumer protein market nationally, ultimately, becoming the largest food company in the U.S. through the Tyson, Wright, Jimmy Dean, Ball Park, State Fair and Hillshire Farms brands. The company’s growth stems from a commitment to consumer quality, environmentaland agricultural sustainability, and cultural and animal responsibility, Harris and Byrne said.